Legends Concert is a Great Success! 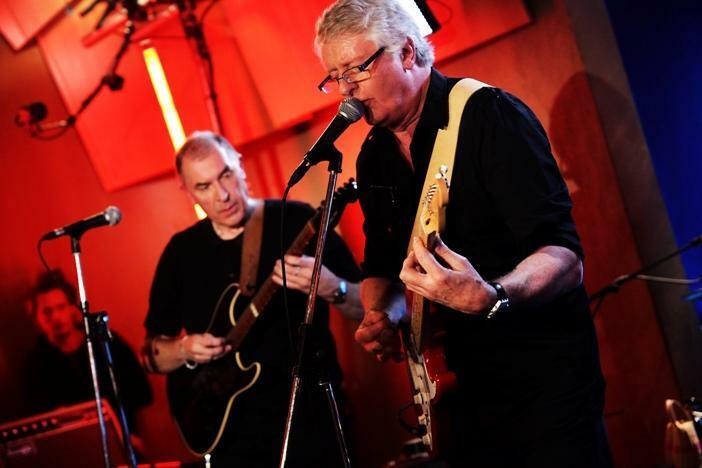 The band and management wish to thank everyone who helped make the Legends concert at Metropolis Studios such a success particularly everyone who paid the high ticket price it would not have happened without your kind support! We will let you know (for those in the UK) when you should expect the recording to be broadcast on ITV. You are all in for a treat. Mark Walker is fantastic on drums – so much energy while staying true to the sound and the band are in very good form – specially when only having being able to rehearse a couple of days in these ridiculous weather conditions. Thanks again to everyone who supported the band for this special event. This entry was posted in Reviews and tagged Legends concert on December 5, 2010 by caravan. May I be the first to say thanks to Martin Davenport John Pearson and to all at Metropolis Studios for an unforgettable day…. it was lovely! I don’t think I was exaggerating when I said in the post-concert TV interview that this was a pivotal event for Caravan. Impossible without everyone who bought tickets and supported us…. fantastic! By the way thank you very much indeed Martin for helping me with my beast of a Mesa Boogie amp after the show!! Way beyond the call of duty! Thank you Caravan and Metropolis Studios for giving us such a memorable experience. Glad you enjoyed it too. Will we get to see you again in the new year??? Heartfelt thanks to Caravan and the management and staff at the Metropolis studios. Caravan were excellent and the chemistry is still very much in evidence. Also loved the new songs and Mark did very well on his debut doing justice to the one and only Richard Coughlan. Great to see Richard on stage a gentleman and a legend. Also nice to meet you all after the show. Very intimate venue it seemed to work well maybe the next tour should include some rural phoneboxes! Hi I would have loved to have been there. Any idea when this will be shown on tv? I can hardly draw breath after the amazing performance by the band. it was simply awesome. I will give a fuller review soon . . for those who were not there. Thanks to JP for his support and belief over the last seven months.If anyone has any photos that were taken at the event that they would like to share please send them to me . Also reviews. Great work with the gig guys and many many congratulations to the lucky people who got to see it! A truly wonderful night and all our thanks to Metropolis and Martin for the organisation – and of course to the Band. What a superb set brilliantly played in an exceptional atmosphere. Great to meet them all afterwards as well. True scholars and gentlemen all and a special cheer for Richard = and Golf Girl Pat too! Thankyou once again to Caravan for making so many people so happy for so long. Wonderful. Greetings from the John Lees’ Barclay James Harvest fan camp – there are some fans of both bands who weren’t able to make it and would like to know what Caravan’s set list comprised. Unfortunately I’m not familiar enough with Caravan’s material to be able to do so. Is there anyone here who could let us know? Not a complete list I know but I was too excited to write them down. I love the John Lees version of BJH I was a fan in the 70s for me to hear The Poet and After the Day again on the very same day that I saw Caravan was icing on the cake. Two great shows by two true legends. Thank you Hogweed! I’ve passed on that list. I’m glad you enjoyed JLBJH too and that you’re a long term fan. I wasn’t around to hear them then! Anyway I’m not trying to make this a discussion about BJH! Keep on Caravanning! I have to say that the use of unusual objects such as spoons (mind you Wishbone Ash have been known to do that one) and most prominently a pair of shears was taking Prog to a new level! Sorry for my lack of knowledge Geoffrey! Oh you definitely played the spoons first then! It’s just something Ray from Martin Turner’s band has adopted in the last few years. You never know … you might have inspired it! Together you and Selling England By the Pound could take care of the gardening it seems! A superb set – I admit to coming down to see JLBJH but although I have been a long-time Caravan fan since a gig at Wolverhampton Polytechnic in about 1969/70 I never expected such a strong performance after a pretty lengthy lay-off. Everyone was great and Mark on drums was exceptional – a real Caravan “feel”. I missed the titles of the new numbers – what are they? Geoffrey I have to say I was impressed with the lead guitar work particularly on “Nightmare”. On previous tours you duetted on viola with Doug Boyle on guitar in the climax of the song. Once you have had more chance to rehearse is there any chance of you duetting with yourself? Liked the gardening gloves by the way nice health and safety touch I thought! The band had rehearsed If I could do it again… for the the encore but unfortunately there wasn’t enough time to play it. Dear Sarah The JLBJH set was great too pleae can you tell us what their setlit was? 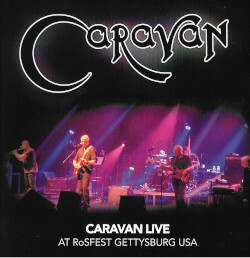 Can’t remember seeing Caravan before with no “For Richard” though. ot sure that’s the exact order though! Ancient Waves was brand new as of the three concerts two weeks ago! I hope you all enjoyed it! I have to say that going back to the sixth form was some come down after that weekend! but I love the subjects I’m taking so I’m back into it now. Just can’t wait to see the photos and DVDs of both gigs! Though I know we’ve got a wait! Oh and I emailed Annika to thank her and apparently the photos should be up early next week! Nightmare I don’t think Caravan would ever contemplate playing without Richard if that was an option. Sadly Richard is too ill and he played some percussion on Saturday. His sense of timing is still 100% and he got a very warm reception and a great tribute from the band and the audience. I cannot believe I missed this awesome opportunity. What a shame. Last Time I saw the band was at Ephraim Gardens in 2001 – where has the time gone? I can’t wait to see this and maybe live in the the UK [Reading area] in 2011. Sitting here listening to Live At Fairfields Croydon and a happy buny. I just wanted to let Caravan fans know that Barclay James Harvest’s founder member Stuart Woolly Wolstenholme sadly took his own life earlier this week. My condolences to John and the rest of BJH who put on a great show in Woolly’s absence. Also to the BJH fans who were present as one who loves both bands I know this is a very difficult time for all. Rest in Peace Woolly and thanks for the wonderful memories. Thank you Hogweed. I don’t think I could have posted that myself. I came on here to attempt to do so but found you had already done so.